Albert was born in Speen in 1880, the fourth and youngest son of William Illsley and his wife Emma née Palmer. There were seven children in total: Emma (born 1861), Annie (1863), William (1865), Sarah (1867), Charles (1869), George (1873), and Albert. William was a farm labourer though the family lived on the edge of Newbury, first in Back Way, Speen (now Pelican Lane, Newbury) and then Monkey (now Monk’s) Lane on Wash Common. Albert went to school at Speenhamland School where he would have had a very basic education, reading, writing and scripture being the main subjects taught. After school Albert also went to work on the farm, as a cattleman, a pastime that evidently did not inspire him – so he enlisted in the Army in 1906. He served with the 2nd Battalion, Royal Berkshire Regiment in India, quite an adventure for a farmhand’s lad from Newbury. His enlistment would have been for 12 years, but only 5 or 7 years would be spent in uniform with a battalion. The remainder of his term would be served in the Reserve; for a minimal commitment of his time he would have received weekly pay but had to be available as and when the need arose to increase the size of the Army. This need arose on 4 August 1914, when Britain declared war on Germany. 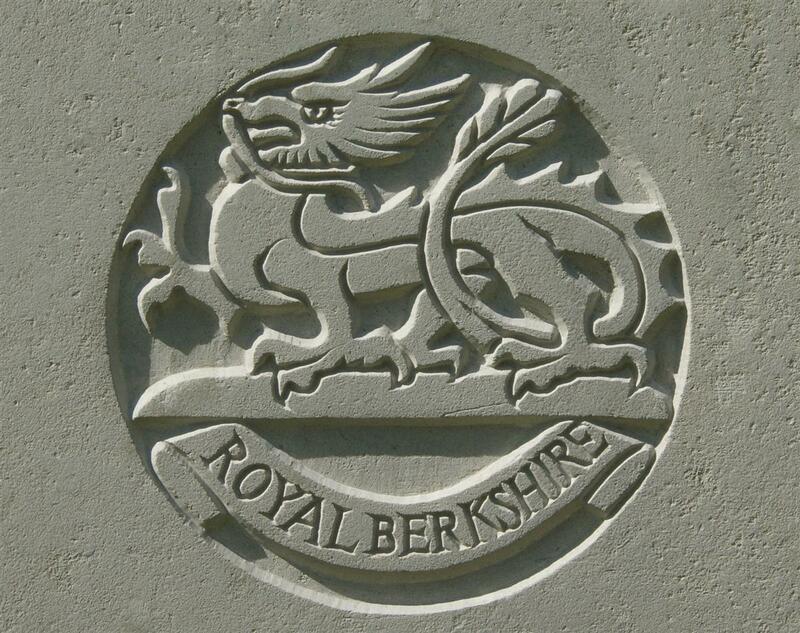 The Reserve were immediately issued with call up notices, many local men were on the boat when the 1st Battalion of the Royal Berks, based at Aldershot, crossed the Channel to France on 13 August. The 2nd Battalion was recalled from India, arriving at Liverpool in October. It became a part of the 8th Division, which was assembling at Hursley Park near Winchester. In fact, the first members of the 2nd Battalion to arrive at Hursley was a detachment of Reserves, very possibly including Albert. The main body arrived from Liverpool soon after and, when the Division crossed to France on 6 November, Albert was with it. Sadly, Albert’s service record has not survived making it impossible to add much detail to his wartime experiences. It is clear from his medal roll entries that he served in three of the Royal Berkshire Regiment’s battalions. After a period with the 2nd Battalion he moved to the 5th Battalion and then the 1st Battalion. On 9 September 1916 the Reading Mercury published a list of recent casualties, which included Lance Corporal A Ilsley – Albert. This shows that he had been entrusted with the first step up from Private. The casualties reported killed in the same newspaper include men who died in August during a period when the 2nd Battalion was manning trenches near Vermelles. This was well away from the Somme front; the battalion had been sent north to recover from its devastating losses on the 1 July when it went over the top in an area known as Mash Valley, just north of La Boiselle. The Germans were using mortars against the British trenches, doing whatever they could to ease the pressure on their struggling comrades on the Somme. It is likely that Albert was wounded at this time. However, his wounds were evidently not too severe for he returned to France, probably to the 5th Battalion (men were far more likely to change battalion following a break in service such as that caused by hospitalisation). It is quite possible that he was wounded again prior to his final move to the 1st Battalion. During all this he gained further promotions to Sergeant, a very responsible role. In August 1918 the Allies finally broke the German defensives and a new form of more open warfare ensued. For weeks the Germans were pushed back, and great swathes of France and Belgium were liberated – but not without cost. Freedom from the trenches also meant leaving the very real protection that trenches offered; despite the steady progress towards Germany and the demoralised state of the enemy British casualties rose. This final period of the war had a higher average daily casualty rate overall than either of the Battles of the Somme or Passchendaele. Another Newbury man has won the Military Medal. 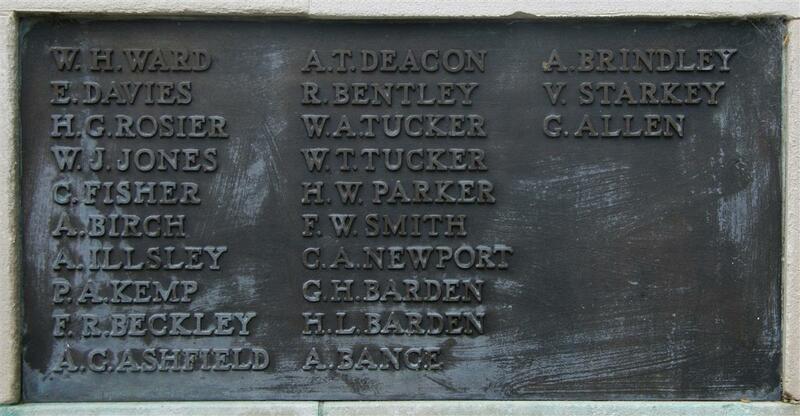 This time it is Sergt A Illsley, 1st Royal Berks Regt, for deeds of gallantry in the recent push on August 22nd. The Battalion was in position by 1.30 AM. B and D Companies were to capture the 1st Objective A and C Companies to pass through them and capture and consolidate the 2nd Objective. Six Tanks (Mark IV) to assist in the attack. At 4.55 AM the attack commenced in conjunction with troops on the right and left. The morning was very misty and it was difficult to keep direction. The Tanks especially were soon in trouble and were of little assistance to the Battalion. However, all objectives were captured up to time with little resistance except from isolated MGs and the 3rd Division passed through to capture COURCELLES and the railway beyond. Battn HQ were established at F18A 9.0 and at 7 AM communication was open with Brigade Hq in the old Battalion HQ at F16B 8.0. At 7pm orders were received that the Bde was to be relieved by 76th Inf Bde and would move to QUESNOY FARM and the PURPLE LINE. No mention of Albert’s deeds, which seem more likely to have taken place on 21 August, during the battalion’s advance towards Courcelles, than during the withdrawal from the line the following day. Mr and Mrs George Illsley, of Raymond’s Cottages, Argyle-road, have been notified of the death of their brother, Sergt A Illsley, 1st Royal Berks, killed in action on Oct 9th, aged 36 years. At 4.30 am the attack commenced and the Battalion moved forward behind the 23rd R Fus and 1/K.R.R.C. When approaching the sunken road in G17. B & D & C Company came under MG fire from some of the enemy who had surrendered to the 23rd R Fus. and then decided to fight again. These men were soon put out of action. On arrival at the 1st Objective (RED LINE) which had been captured by the 23rd R Fus and 1/KRRC it was found that the 3rd Division had lost direction and come a long way too far to the left. When the Battalion moved through to attack the 2nd Objective there were no troops on the right flank, and B Company (in touch with 1/KRRC) were about 500 yards to the left of C Company. Consequently on approaching FORENVILLE C and D Companies came under intense M.G. fire from both flanks and were unable to get further than the main road. At about 8.15 AM 5 enemy tanks drove back the 63rd Division and 1 enemy tank drove back the 3rd Division to the RED LINE. These tanks commenced to work along the RED LINE, but heavy Lewis gun and Rifle fire was opened on the tank moving N from SERANVILLERS and it finally turned and withdrew: the Tanks operating in the vicinity of NIERGNIES appeared to be put out of action. At 8.30 AM an order was sent to C and D Coys to withdraw to the RED LINE under heavy M.G. fire from both flanks and their left rear these two companies (about 80 strong) managed to regain the main line. The Battalion was then reorganised A and B Companies holding the RED LINE, with C and D Companies 500 yards behind in G180. At 1 pm instructions were issued verbally by the B.G.C that the attack on FORENVILLE was to be carried out at 4.30 p.m. with 1 company of 1/KRRC on the left, 2 companies if 1/R.BERKS on the right with 2 Platoons of 23/R FUS. The 3rd Division were to be asked to capture SERANVILLERS at the same time. ZERO hour was afterwards put forward to 3 PM as the 3rd DIVISION had already attacked SERANVILLERS at 1PM, Accordingly A and B Coys attacked at 3 PM. (Orders marked C Attached) The attack again met heavy M.G. fire from the right flank as the 3rd Division had failed to capture SERANVILLERS and little progress was made. At 6 PM the 17th R FUS passed through and attacked FORENVILLE in conjunction with the 3rd Division on the right, and as SERANVILLERS and LA TARGETTE were captured the attack was successful and FORENVILLE taken. At 1 AM SC138 (attached marked 'D') was received stating that the Division would be automatically relieved as the Guards Division passed through to continue the attack The Battalion was to concentrate W of NINE WOOD and then march to bivouacs N of FLESQUIERES. Casualties during the operations were as follows:- Officers. KILLED :- LIEUT. C.C. Hedges M.C., 2/LT L.E. Saville died of wounds:- 2/LT W Tomey wounded:- 2/LT C.H. Banner 2/LT K.B. Catchpole; Other Ranks Killed 16 Wounded 86 Missing 12 N.Y.D Gas 4 The Battalion arrived at 11 AM [At Flesquieres] Day fine 2/LT H.E. Hale joined the Battalion, Lt C Lapworth also joined the Battalion as Quartermaster. Once again there is the suspicion that the critical action took place the day before his reported date of death. It is possible that he was wounded on 8 October and died the following day. He was buried in grave D.10 at Forenville Military Cemetery. There is some confusion over his home address, records varying between his widowed mother’s address in Newtown and Argyle Road, Newbury, where his elder brother George was living with his wife and children – including a stepson, Albert Swain, who also died during the war. As their mother died in early 1919 this suggests that George took on the responsibility for handling issues arising from Albert’s demise.